Rome, Arata and Baxley is proud to call Houston home. Two of our attorneys, Bristol Baxley and Corey Kronzer live in Houston and defend the rights of Houston area railroad workers from our Pearland office. We have successfully handled railroad injury cases in Harris county against Union Pacific, Amtrak, BNSF and most major railroads. We are extremely proud of the results we have achieved for our Houston area FELA clients. The Houston area railroads recognize our name and know that it means that the injured worker is represented by one of the best FELA lawfirms in Texas. Please feel free to ask us for a referral and we will put you in contact with one or several of our satisfied FELA clients from Houston or the surrounding areas. Houston is a melting pot city, in part because of its many academic institutions and strong industries as well as being a major port city. Over 90 languages are spoken in the city. Many jurors in the Houston area have a unique perspective on railroads. Almost every chemical plant in the Houston area is serviced by one or more railroads. For anyone who has ever worked in the chemical plants in Pasadena, Deer Park, Texas City or near the Port of Houston, getting a close up view of the work involved in the switching of tank cars familiarizes people in Harris County with the dangers of railroad work and the importance of railroad safety. Even those folks in Houston and who haven’t seen switching work done up close will have lived by or driven by tracks carrying railroad chemical cars for years and must know that it is the railroad worker who ensures the safe passage of these dangerous chemicals through their community. 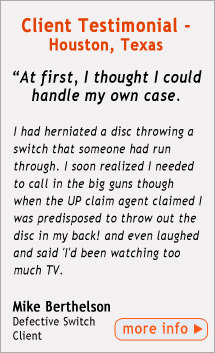 These personal experiences that many people in Houston have with railroads can be very important in any case where the railroad has put profit before safety. Houston was founded in 1836 near the banks of the Buffalo Bayou and is named after the then President of the Republic of Texas, Sam Houston. Transportation was a major problem for early Texas settlers. Many locally owned Texas railroads were chartered to help move people and goods, several of them near the thriving port city of Galveston and nearby Houston. In 1900, after Galveston was struck by a devastating hurricane, efforts to make Houston into a viable deepwater port were accelerated. The following year, oil discovered at the Spindletop oil field near Beaumont, Texas prompted the development of the Texas petroleum industry. In 1902, President Theodore Roosevelt approved a $1 million improvement project for the Houston Ship Channel. By 1910 the city's population had reached 78,800, almost doubling from a decade before. Houston eventually grew to become the 4th largest city in the United States. Today Houston is recognized worldwide for its energy industry — particularly for oil and natural gas. Much of Houston's success as a petrochemical complex is due to its busy man-made ship channel, the Port of Houston. The port ranks first in the United States in international commerce, and is the tenth-largest port in the world. Not surprisingly as Houston grew, the railroads thrived and today the Houston area railroads continue to provide critical transportation of goods in and out of this thriving port city. 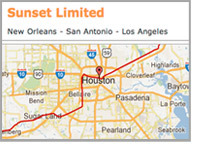 Amtrak serves Houston via the Sunset Limited which runs from Los Angeles to New Orleans mostly along the I10 corridor. 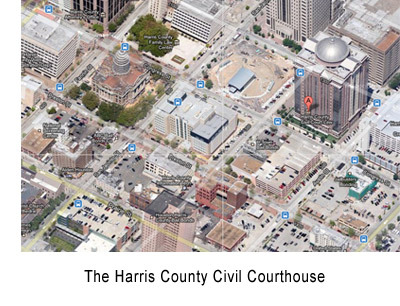 The Houston Amtrak Station is located at 902 Washington Avenue, Houston TX 77002. It is a station building with available ticket purchase and an enclosed waiting area. Burlington Northern and Santa Fe is the corporate heir to the Atchison Topeka and Santa Fe which was operating in Houston before 1900. In 1924, the Port Terminal Railroad Association (PTRA) was formed to consolidate service to the industries along the Houston Ship channel for all railroads entering Houston. Today the PTRA is an Association of the Port of Houston Authority and three (3) Class I railroads: Union Pacific, Burlington Northern Santa Fe and TexMex/KCS. KCS's Houston operation has become even more important since NAFTA was passed in 1994. KCS has historically connected Northern markets to the port cities on the Gulf of Mexico. After NAFTA, they acquired the Tex-Mex railroad and trackage rights over Union Pacific track in Houston. These trackage rights allow KCS to connect to their Tex-Mex system. Union Pacific is the corporate heir to the Southern Pacific and Missouri Pacific railroad systems among others. As such, they have been operating in Houston since before the turn of the last century.